IDEA’s work on a market surveillance study on Limonene and Linalool hydroperoxides in finished consumer products has been published in Food and Chemical Toxicology. Conclusion: the nature and source of the inducing agent responsible for the frequent positive patch test reactions to oxidized terpenes remains elusive. 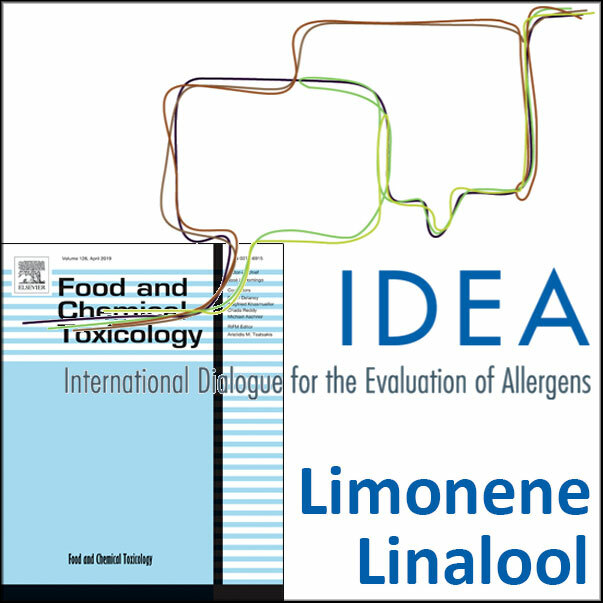 The International Dialogue for the Evaluation of Allergens (IDEA)‘s work on a market surveillance study on Limonene and Linalool hydroperoxides in finished consumer products has been published in Food and Chemical Toxicology. The paper, ’Exposure source for skin sensitizing hydroperoxides of limonene and linalool remains elusive: An analytical market surveillance’ by Andreas Natsch, Marco Nägelin, Hans Leijs, Michel van Strien, Elena Giménez-Arnau, Matthias Vey and Cécile González, was published in the Food and Chemical Toxicology 127 (2019) 156–162. “Positive patch test reactions of dermatological patients to oxidized samples of linalool and limonene are frequently reported. The sensitizing ingredients in the oxidation mixtures are hydroperoxides (HP). It is not clear whether fragranced consumer products are a relevant exposure source for HP. Analytical methodologies had been validated, allowing quantification of HP in different consumer products.